× Notice: The El Paso County Courthouse will be closed on Friday, April 19, 2019 in observance of the Good Friday holiday. Normal business hours will resume on Monday, April 22. The department works with other entities to maximize resources in a cost effective manner, prevent duplication of efforts, and provide a continuum of care for those involved in multiple systems. The Budget Department is responsible for preparing a proposed county budget that reasonably illustrates actual or estimated expenditures as well as resources for the year. Court Appointed Special Advocates trains and supports court appointed volunteers to advocate for abused and neglected children who need representation in the family court system, serving these children's best interests quickly and efficiently. The El Paso County Coliseum is managed by the El Paso Sports Commission, Inc. The Coliseum hosts a variety of events throughout the year, including Disney on Ice and the Southwestern Livestock Show and Rodeo. Commissioner Carlos Leon represents the East section of El Paso County. Commissioner David Stout represents the Central section of El Paso County. Commissioner Vincent Perez represents the Far East/Southeast section of El Paso County. Commissioner Carl L. Robinson represents the West/Northwest section of El Paso County. To provide a safe and healthy quality of life that enables people to thrive and reach their potential through the efficient, effective use of County community and social service programs. The Constables are officers of the peace that serve respectively in each of seven county precincts. County Attorney represents the County in civil lawsuits and provides general legal advice to the members of Commissioners Court during Court meetings with respect to the performance of their official duties. The office also provides a "hot check" collection service. The auditor oversees accounting, payroll, budgets, assets and finances for the County. This office monitors all financial activities for compliance with County policies, as well as with Federal and State laws and regulations. The County Clerk files, indexes and transcribes documents, and safeguards information for use by the general public and other County departments (includes records of all judgments, payments, and warrants). The County Judge Ricardo A. Samaniego serves as the chief executive officer of county government, and presides over its governing body, the Commissioners Court. View Court Directory, Council of Judges and County Court Administration information. The Courthouse Cafeteria is located in the lower level of the El Paso County Courthouse. The Criminal Justice Coordination (CJC) Department has a mission to enhance pretrial justice and to provide quality justice services. The District Attorney prosecutes state cases in Culberson, El Paso and Hudspeth counties (34th Judicial District). This office also administers the Victim Assistance Program for victims of misdemeanor, felony, and juvenile crimes. The District Clerk serves as registrar, recorder, and custodian of all court pleadings, instruments, papers that are part of any cause of action in certain courts. This office also coordinates the notification, swearing and impaneling of jurors, secures court records, maintains court dockets, collects fees and issues writs, citations, warrants and executions. The Domestic Relations Office specializes in Family Law assistance and enforcement as authorized under chapters 202 and 203 of the Texas Family Code. The Department’s mission is to create job opportunities for new and existing industrial and commercial development that expands the tax base, thereby improving the quality of life and prosperity of the county. The El Paso County Community Supervision and Corrections Department (El Paso County, CSCD) provides probation and community corrections services to 14 District Courts, 6 County Courts-at-law, 4 County Criminal Courts and the Jail Magistrate Court and 2 County Courts in the region. The Elections Department conducts elections for government and other public entities within the County. The Elections Administrator is also the voter registrar for the County of El Paso. The first county Code of Ethics in the state of Texas regulates the conduct of certain county officials, all department heads, committee members, board members, commission members and most county employees to ensure the highest standard of public conduct. Building Maintenance Section is responsible for the maintenance, operation and housekeeping duties of all County-owned buildings. Financial Recovery is a division under the Budget and Fiscal Policy Department. The Financial Recovery Division regains monies from those that have exhausted resources throughout the judicial process. The authorization for the recovery of spent resources is by court order. These are resources initially funded by taxpayers. The Fleet Manager (management) is a department under the direct control of the El Paso County Commissioners Court. The department's core services include monitoring, coordinating, and advising on all County vehicles to include acquisition, maintenance and disposal. Human Resources handles personnel and risk management issues. It is responsible for staffing, wage and salary administration, record keeping, and maintaining a current employee database. Other duties also include: loss prevention, loss control, insurance and monitoring results to minimize significant financial loss. The Information Technology Department (ITD) provides processing and programming support for administrative applications including: accounting, budgeting, elections, the criminal justice information system and traffic warrants, among others. ITD supports the jail and warrant systems 24 hours a day, seven days a week. Justices of the Peace are elected officials who serve respectively in each of seven County precincts. Jury management system that allows you to complete questionnaires, respond to jury summonses, post-pone your jury duty date, find answers to the most frequently asked questions about jury service, request qualified exemptions from jury service, and much more. The Juvenile Probation services are intended to protect and provide for public safety, provide family-focused services (including treatment, training and rehabilitation) and recognize the legal rights of juveniles and parents. 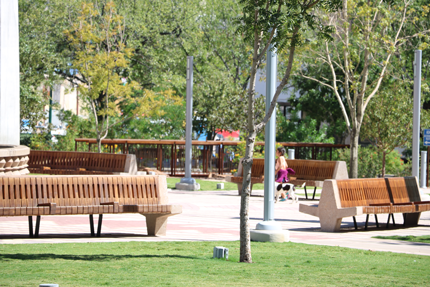 The Library serves not only the Bench and Bar of El Paso but the general public as well. Since opening on May 23, 1950, the Library has become one of the largest and most progressive in West Texas. The Office of the Medical Examiner conducts death investigations and autopsies of suspicious or unexpected deaths in El Paso County. The Medical Examiner also authorizes cremations, reports viable tissue candidates to the local tissue bank and assists families with funeral arrangements, among other services. A senior nutrition program providing a 1/3 Required Dietary Allowance noon time meal to El Pasoans 60 years of age or older. The County parking facility was built to provide adequate parking for jurors summoned to the County Courthouse for jury duty. Spanning 1,000 acres, Ascarate Park features an 18-hole golf course, lake, lakeside boardwalk, fully-equipped aquatic center, playgrounds and picnic facilities. The County Probate Court handles all probate matters of El Paso County, including wills, estates, guardianships of adults and minors and mental health proceedings. The Public Defender provides legal representation for indigent defendants in felony criminal cases. El Paso County Public Works provides certain infrastructure for unincorporated areas of the county. Public Works also manages most County parks, the Fabens Airport, the Pauper Cemetery, Certificates of Compliance and more. Purchasing buys all materials, supplies, services and equipment for the County. This offices also administers property control and tracking of fixed assets for the County. The Sheriff's Department is responsible for enforcing all laws within the El Paso County. The "Tax Office" collects property taxes for the County. 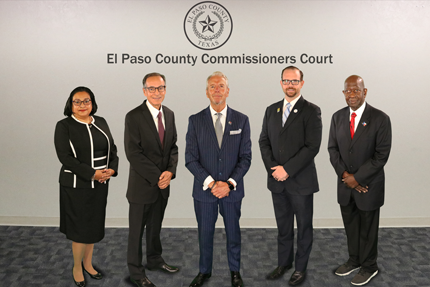 Currently, the City of El Paso collects property taxes for all taxing entities by an interlocal governmental agreement approved by Commissioners Court. The Tax Office also collects state and county fees, automotive license renewals and registrations, title transfers, beer, wine and liquor licenses, occupational permits, and hotel occupancy taxes. Texas A&M AgriLife Extension is the educational outreach agency of the Texas A&M University System linked in a unique partnership with the nationwide United States Department of Agriculture’s Cooperative Extension System and the El Paso County Commissioners Court. Routes and schedules for all county bus routes. This program provides assistance for veterans and their dependents in any manner pertaining to the Department of Veterans Affairs and helps to administer the veterans programs of the State of Texas. Copyright © El Paso County, Texas. All rights reserved.